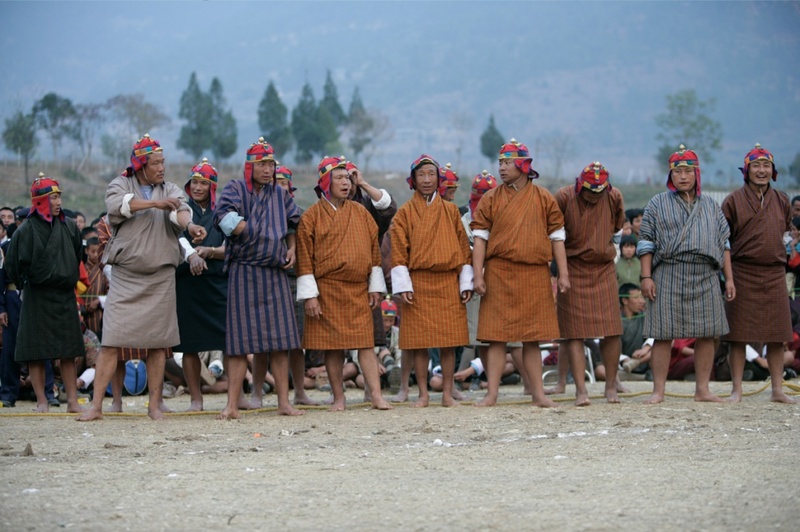 Bhutanese men wear a heavy knee-length robe tied with a belt, called a Gho, folded in such a way to form a pocket in front of the stomach. Women wear colourful blouses over which they fold and clasp a large rectangular cloth called a Kira, thereby creating an ankle-length dress. A short silk jacket, or Toego may be worn over the Kira. Everyday Gho and Kira are cotton or wool, according to the season, patterned in simple checks and stripes in earth tones. For special occasions and festivals, colourfully patterned silk Kira and, more rarely, Gho may be worn. Additional rules of protocol apply while visiting a Dzong or a temple, or when appearing before a high level official. Male commoners wear a white sash (Kabney) from left shoulder to opposite hip. Local and regional elected officials, government ministers, cabinet members, and the king himself each wear their own colored kabney. Women wear a narrow embroidered cloth draped over the left shoulder called Rachu.